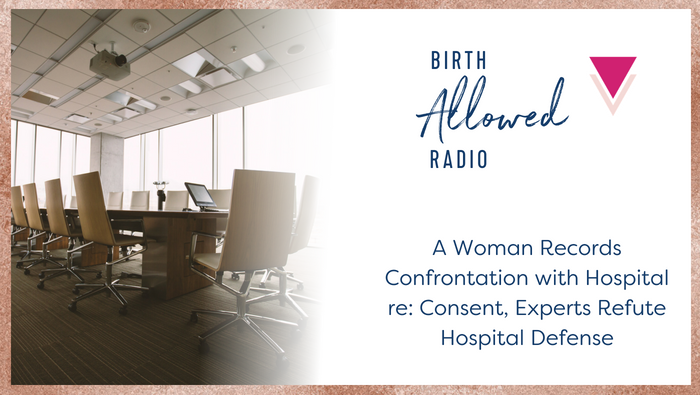 In this episode, Cristen speaks with “J,” an Indiana mother who recorded the meeting with her hospital about a non-consented procedure during labor that the hospital defended as “appropriate” and “part of” routine care. In the same episode, human rights and birth lawyer Farah Diaz-Tello and Maternal-Fetal Medicine doctor Emiliano Chavira explain why the hospital’s claims are dead wrong. Below is some background on the situation and a transcript of the meeting. Dear [J], The intent of this letter is to follow up per our conversation of September 16th. As previously discussed a full review of your medical chart specific to your visit on July 13th is complete. The Physicians, including the section chief of Maternal Services, participated in the peer review and have concluded the care revived [sic] during the visit in the Labor and Delivery Department was deemed appropriate. PA: So, would you like to start? J: Yes! Um, basically, um, I guess what I’m trying to rattle around in my brain is trying to understand, um, through the eyes of the hospital, you know, why it was thought to be appropriate to do the membrane strip without being told, because, I mean, the letter that I got from the peer review just said, um, the treatment given was deemed appropriate. That’s all I was given; I wasn’t given any other information as to why or anything about, you know, what was the [inaudible] and I know I’m not privy to that information. PA: And that would be why the letter is very brief, in description–what happens with meetings with our section chiefs and their physicians is, is kept to that meeting. That is theirs and, and logged appropriately. Uh, [name deleted] can speak more on the physicians’ standpoint, she works very closely with all of the OB/GYNs, um. I think it’s fair to, to discuss the process you experienced with the OB ED [emergency department] physician–you did not develop a, a positive relationship with that particular physician. Be that as it may, the membrane sweeping is part of the exam. It’s, it’s, it’s part of the exam. When you sign the consent for care, that, that goes from the beginning all the way through until discharge. So, if you’re going to have a procedure such as surgery, there’s another consent for something like that. But when it’s part of the exam per section chief [overlapping voices]… That’s part of it. You came with an expectation for care and that was what you received. J: Because everything that I’ve, you know, looked at and researched on medical journals and such [inaudible] that a membrane strip is a procedure done to initiate labor. And it intends to do that. LD: –it’s just not something we’re going to start at this time. J: But a physician usually has, you know, his common rapport with a, a patient is to, you know, go through and say, hey, we’re going to do this, is it okay. Even if they’ve signed the bl–you know, you’ve signed the blanket consent form, just getting that extra verbal consent and walking your patient through what’s going on. Because somebody like me, who suffered sexual assault as a child, I have some bodily autonomy issues, and coming in and having people poking and prodding in my private areas is difficult enough, let alone, you know, somebody doing something there without saying, I’m going to do this, or would you like me to do this. PA: J, when you came in to facility, what were the expectations for the care? What–I guess that would be my, my first question. What, what were your expectations? LD But you told us on the phone three days before that in the office you had actually requested this to be done to you. J: Yes. By my physician, who I said it was okay to do it. I didn’t know this, I didn’t know Dr. R__ at all, you know. I’d never met her. She came in, she was rude, she was pushy, and then she just came in and just did that and then said well you can either stay or leave, it’s up to you. And at that point I was like, I’m going to go. I, I don’t even want to be here right now. And… it was extremely upsetting. PA: I am sorry that your experience didn’t meet your expectations. We will always apologize for any drop in communication, which I kind of feel like we had here, but I also feel like when you came into this facility, you, you were seeking care, and we did provide the care that was necessary at the time. Our communication from a physician’s standpoint isn’t anything that we approve of. We want our physicians to be kind, caring professionals. I don’t know this physician so I can’t speak to her. Um. I always expect our physicians to communicate well with our patients. OB ED is, is, is a different atmosphere than your physician’s office. They see all sorts of emergent situations where they must move and move quickly. They can’t be that warm, professional person that you’re used to in the physician’s office–and I’m not telling you anything you don’t realize… but when we communicate all of these concerns on a physician’s basis that work in the OB/GYN field, we have to lean on their expertise. We have to listen to what they have to say, which is: it isn’t a procedure. It doesn’t need a consent. And this was a group of physicians deciding this together when it was tabled and questioned. From our standpoint, we have to, we go with what our policies support and physicians approve. And that’s our, that’s our business day. I feel like you, you, you were disappointed in, in, in that visit. I hope in the future we can be something that meets your expectations–but that’s, that is, that piece is not going to change and I don’t want your expectation to be that that is something you’ll see in future. That’s, that’s not going to change: those physicians are very… very… They, they truly believe what they’re doing is, is the best practice or they wouldn’t be doing it. LD: And it’s consistent with what other people are doing… other facilities and other OBs, physicians, but… Like I don’t want you to just walk away thinking we just made this up in this hospital. This is nationwide. J: –I didn’t have any kind of problem. I just had Dr. [name deleted] and that was it. And, you know, she was there from start to finish, and there was never any kind of issue. LD: So that will be new moving forward. There will always be an OB ED physician–there will always be an OB physician in the OB emergency room and you will always come into our department for that, unless you come for a scheduled C-section. You will see that person. Um. So. And, and you’ll see that person for anything, like for a labor check, or if you come in and you’re having another issue related to pregnancy. All the physicians–all the patients that come in to our OB ED are seen by that physician. Um. Uh, I don’t… I don’t know… [inaudible] It’s a law? It’s a quality measure, I guess, that patients have to be seen within a certain timeframe, so we just have to expect the OB physicians to meet that requirement with their office load and stuff. So, just in the future, know that if you come in, you will see one of them. PA: So, I, I, I feel like, your concern was not met or recovered what you feel like what your visit was at that particular time. We feel like we’ve done our homework to make sure and verify and table this and take this through the appropriate channels to respond to your concern. Do you feel like we’ve met that? J: I think that’s about all the information I’m going to get. If things aren’t, if it’s not going to change, it’s, you know, it’s not going to change, I guess. PA: Well, we thank you for your feedback, and I mean that sincerely. We can’t improve or grow–and I put that in the letter but that’s not a pat statement! I say it every day. We can’t improve or grow if we don’t hear the feedback from the people that are experiencing the care as a patient. So, thank you. And the physicians had a topic to discuss at the meeting and brought it to the attention. So… we heard your voice and we understand it isn’t probably what you wanted to hear but we did want you to know we took it seriously and we took it to every channel we could. Okay? LD: Um, J, is there something we can do for you other than… I, I know that… I mean, is your ideal outcome to see what is obtained as consent… I guess I want to know what’s your ideal resol–like, what would make you walk out of this meeting and be like, yes, this is what I wanted. J: A “as long as I’m up there” kinda thing, or? LD: Well… I think a lot of them, it is viewed as part of the vaginal exam. I guess. Is that–am I stating that correctly? J: I don’t understand where that is, that I’m, is there a way I can get that in writing or something, because I don’t, I have not been able to find any evidence of that anywhere, how it’s considered part of a standard cervical check. J: I don’t know if that makes entirely an amount of sense, but… my husband was going to be here to, for support, but he got called in to work and he wrote something down he was stewing over in his mind about it, before. J: He says: We understand that a membrane sweep has over the years been a relatively standard procedure that few people have given much thought of, but it is an action that can affect the progression of labor and anything that alters the timetable of a woman’s pregnancy or delivery should be done with her consent. [inaudible] that the form is enough. The fact that a doctor was in the vicinity of your cervix is irrelevant. It takes very little time to ask to ask a question or even explain the process or effects of a process like a membrane sweep. If an older man comes in to have his hemorrhoids examined by a doctor, does the doctor take, um, his already gloved fingers, penetrate the man, and examine his prostate because that’s a common medical practice also while he’s up there? This is why you shouldn’t sign the hospital’s blanket consent form unless you really don’t feel a need to have any say in what they do to you. You should instead amend the blanket consent form to say that you expect each relevant clinician to ask for your consent before doing any procedure to you, and that you will consider whether or not to consent at that time. Though you might want to consider before you go into labor whether you want anything to do with that hospital (or any hospital) in the first place. You might prefer to plan on birthing at home. Was she overdue? She should have had the opportunity to have a discussion about if she wanted the stripping done which may hurry along her labour. The OB does not have the right to make that choice for her. Stripping is NOT a usual procedure done when a pt comes for a labour check. I’ve been a LD nurse for 38 years and have never seen this happen. Always a discussion between OB and pt and its her choice. A membrane sweep is NOT a routine part of a cervical exam. It is a specific procedure that is used to progress or initiate labour, like cervidil or oxytocin. It is invasive and can be very painful. This hospital was doing ye old CYA by saying it is part of the pelvic exam. I’m a Canadian midwife and have years of schooling and obstetrical practice too. You don’t just sweep a woman’s membranes without her consent. Total BS! It’s acceptable because women’s right’s for autonomy and respect are constantly ignored and unrecognized. This wouldn’t likely happen in any other medical discipline that isn’t woman centered. I have also had one of these done without consent “while they were up there” in the OB office while “late” with my first VBAC. I actually had no idea what happened until some years later. The birth itself felt like a huge violation – I’d even go so far as to say I felt raped and, yes, I’ve been raped so I’m very much able to compare. After realizing what happened to me in the OB office, I felt violated all over again. That was also the last birth with an OB for me. My following birth was with a CNM in hospital and the three after that were all at home, with CNMs, all of which respected me, my body, and my pregnancy.